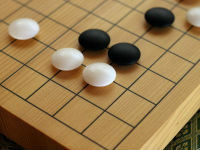 Learn to play the ancient and mysterious board game known as Go. Developed 4000 years ago in China, the rules are so simple they can be taught in a few minutes--but it can take a lifetime to master the game. Go boards are provided and take-home sets made of cardboard are available for free. Ages 5 and up.